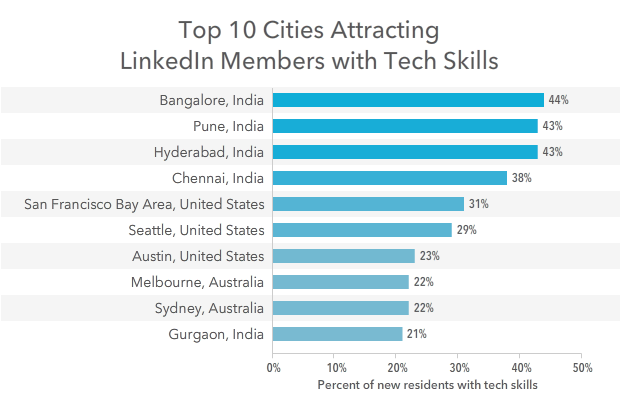 For the 52 cities we looked at, the median percentage of new residents with tech skills was 16%, or just under 1 in 6. Several Indian cities were clocking in more than double that. This is indicative of several trends; more people are moving to big cities than ever before, and the Indian technology sector is experiencing explosive growth (though this should hardly be news to anyone). Additionally, and maybe not surprising, nearly 1 out of every 3 new residents who moved to San Francisco in 2013 had technology skills. Yet, San Francisco isn’t the only city experiencing a tech boom. Check out the interactive map below to see how 52 cities across the globe stack up. Hover over each city to see more details. Cities that attracted a greater proportion of members with technology skills tended to skew towards the “Java Development” and “Web Programming” categories. As we continue to build the Economic Graph, a digital map of the global economy, we’ll be able to monitor the growth of sectors like technology with increasing speed and detail. Providing more insight into these issues has the potential to help every professional, regardless of what they do, obtain economic opportunity. *Methodological details: The results of this analysis represent the world as seen through the lens of LinkedIn data. As such, it is influenced by how members chose to use the site, which can vary based on professional, social, and regional culture, as well as overall site availability and accessibility. These variances were not accounted for in the analysis. Additionally, nationality and visa status are not fields included in the LinkedIn profile. Therefore, we cannot make any inferences on the citizenship of our members who were included in this analysis. We determined the geographic movements of our members in the last year by looking at every new position that was added to profiles between November 2012 and November 2013, which included a regionally specific location (e.g. “Greater Los Angeles Area”) that differed from the regionally specific location of the previously held position (e.g. “Greater New York City Area”). Next, we excluded movements which did not exceed 100 miles (161 km), based on the direct distance between two geographic coordinates, generalized as the geographic center of each region. We isolated cities that saw at least 10,000 new residents in the 12 month period and determined the percentage of new residents with technology skills by dividing the number of new residents with technology skills by the total number of new residents. “Technology skills” include (but are not limited to) the following categories: Algorithm Design, C/C++, Cloud and Distributed Computing, Computer Graphics and Animation, Data Engineering and Data Warehousing, Embedded Systems, Game Development, IT Infrastructure and Systems Management, Java Development, Machine Learning, Middleware and Integration Software, Mobile Development, Perl/Python/Ruby, Software Engineering Management, Software QA and User Testing, User Interface Design, Web Programming, and Virtualization.